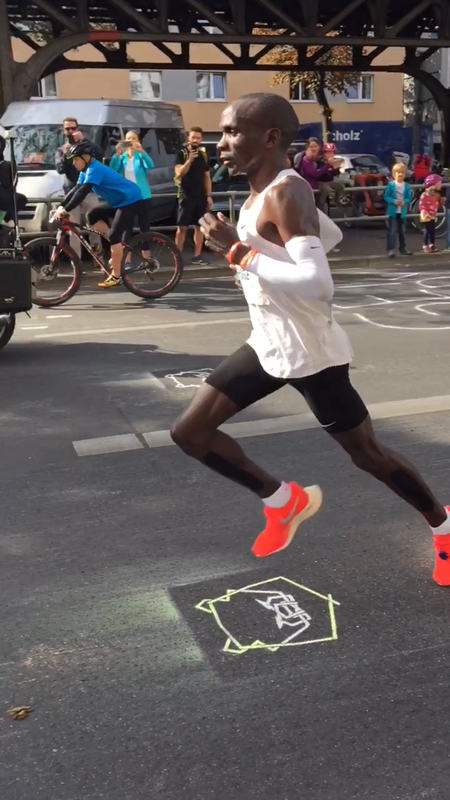 BMW Berlin Marathon 2018 world record breaker running video towards the end of the course we saw the helicopter and the lead cars and knew he’d be coming soon. Sunday morning, I walked from the train to the Schoenefeld Airport and noticed the scaffolding was down and the painting of the mural complete. I saw the artist’s name, Steven Karlstedt. You might remember the photo of the painting of the mural when I arrived a couple of weeks ago. Farewell until my next visit. Red beet fries. Just around the corner, I saw a painted sign on the glass window of Schoene-Burger and asked my son if he’d get some to try with me sometime. Tonight he came home after work with an order of Beet Root Fries. Still hot. We were walking around Alexanderplatz looking for a spot to sit to sip a Radler, and my son said, “There’s a man rappelling up on the Fernsehturm” (TV tower). You can see him in the second, third and fourth photo. Maybe he was cleaning the windows? Can’t see any equipment, though. There’s an observation deck and a restaurant inside the tower where you can get a great view when the sky is this blue. I never would have seen him if he hadn’t pointed him out to me. Didn’t travel with a big camera this trip, so no 70-200 lens to get a clear view. neighborhood Ice cream. That’s what the translation is! Celebrating a year in business. The neighborhood of Schoenberg in Berlin Germany. All the other ic shops are shuttered for winter break. Worth a trip to Berlin. You might have seen my recent post about the unique and delicious Lebkuchen IceCream. Meet Herr Gunnar Bruckner. Owner and creator of all the wonderfully flavorful ice cream. I asked if he would be in my People at Work Series and he graciously agreed. After twenty five years in United Nations and International Affairs Work, he has found his home. And close to home. Right in the neighborhood. He showed me how he mixes the ice cream and has several freezers with different temperatures. Using the finest ingredients from trusted sources is key to success. Saffron threads. German Mustard Seed Pickles, and Vanilla beans which he scrapes out the interior. He’s made cilantro ice cream and I had the fresh plum. There was grapefruit and elderberry and mango, too. I asked if there were any flavors which didn’t work out and he told me about a goat cheese one with way too much goat cheese- a tiny dollop okay for a small canapé but not acceptable to sell as ice cream. An expensive experiment but people enjoy the German mustard seeds/ pickles ice cream. Did I mention he can make a fancy coffee or espresso for you, too? Scooping out small scoops so the chocolate shake I ordered for my DIL will mix perfectly. Stay tuned for tomorrow’s post featuring Dagmar Bruckner, glass bead Artist with a shop and gallery just around the corner. She created this glass pin for her husband’s lapel. A good conversation starter. Thursday I was photographing some food items for a Things to Eat in Berlin Gallery. When I saw the wurst stand I went up and asked if it was okay to take a picture. My plan was to snap the big pile of wurst on the grill. But suddenly I had some generous posing chefs. And oops, I realized the man on the left in the photo below wasn’t in my frame and he was standing with a wurst, too. Do over! I took another shot to include him and suddenly a photo bomb appears behind the three men. Thank you, gentlemen. You made my day!